We’re approaching Labor Day weekend here in the United States. Labor Day weekend is traditionally thought of as the end of summer, even though summer doesn’t officially end for another few weeks. Children will be heading back to school soon, if they haven’t already, leaves on trees will start changing colors soon, and summertime produce will be replaced with hearty autumn harvests. The holiday is usually celebrated with outdoor eating, such as cookouts, barbecues, and picnics. 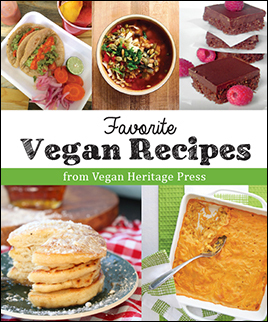 We’ve put together a menu of vegan Labor Day recipes from our cookbooks that are perfect to serving to friends and family this weekend. 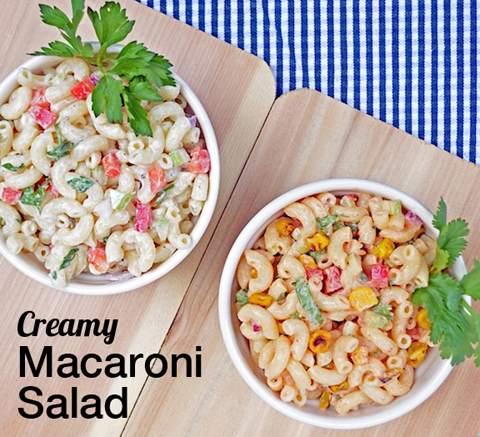 Creamy Macaroni Salad from Everyday Vegan Eats by Zsu Dever – Macaroni Salad is a dish that quintessentially summer and can often be found at outdoor potlucks and cookouts. This vegan version of the classic salad is sure to please all of the guests at your summer gathering, no matter what their dietary preference. Other great barbecue side dish recipes such as Buttermilk-Style Coleslaw and German Potato Salad can also be found in Everyday Vegan Eats. 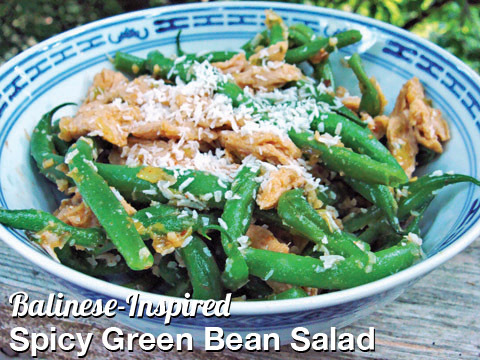 Balinese-Inspired Spicy Green Bean Salad from World Vegan Feast by Bryanna Clark Grogan – This dish is a very simplified, North-American version of the Balinese salad “lawar.” Lawar is fairly complicated to make, and Bryanna didn’t have access to some of the spices need to recreate it at home, but her version is absolutely delicious. Because this dish can be served at room temperature, it’s the perfect dish to serve at summertime picnics and barbecues and is a refreshing change of pace from the usual coleslaw. Red, White and Blue Potato Salad is another great side dish option from World Vegan Feast. 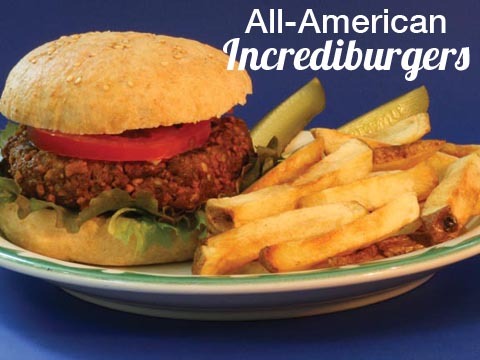 All American Incrediburgers from American Vegan Kitchen by Tamasin Noyes – Everyone will want to try one of these burgers right off the grill. The minced onion, which steams into the burgers, give these a wonderful old-fashioned diner taste. 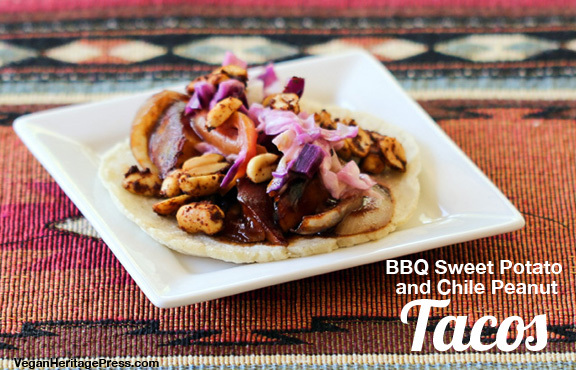 BBQ Sweet Potato and Chile Peanut Tacos from Vegan Tacos by Jason Wyrick – If you’d rather have a bit of a non-traditional meal this Labor Day weekend, give these BBQ tacos a try! The recipe was inspired by the barbecue dishes Jason ate while living in Fort Worth, Texas. These tacos are messy, a bit decadent, but oh-so-tasty. If you want to up the heat level, add some minced serrano peanuts chiles to the top. 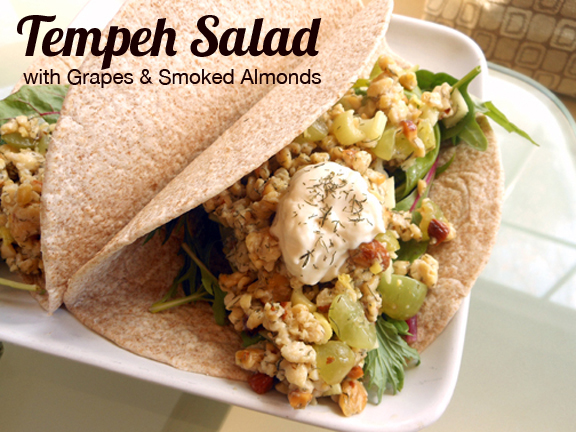 Vegan Tempeh Salad with Grapes and Smoked Almonds from The Blooming Platter Cookbook by Betsy DiJulio. Grapes add color, moisture, and natural sweetness to this hearty salad, while nuts add depth of flavor, crunch, and nutrition. If you’re celebrating Labor Day with a picnic rather than a barbecue, this tasty salad makes for a wonderful sandwich filling. 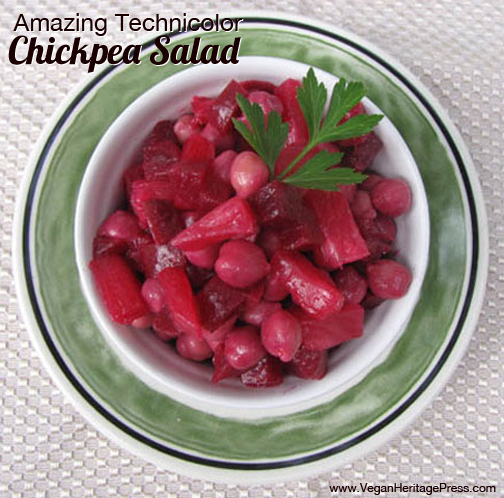 Amazing Technicolor Chickpea Salad from Vegan Unplugged by Jon Robertson with recipes by Robin Robertson – This super simple, yet extremely tasty, salad comes together in a flash and is perfect for a picnic dish. Beat-the-Blahs Black Bean Patties and Chickpea Spread from Vegan Unplugged are both also excellent dishes for serving at picnics and potlucks this weekend. 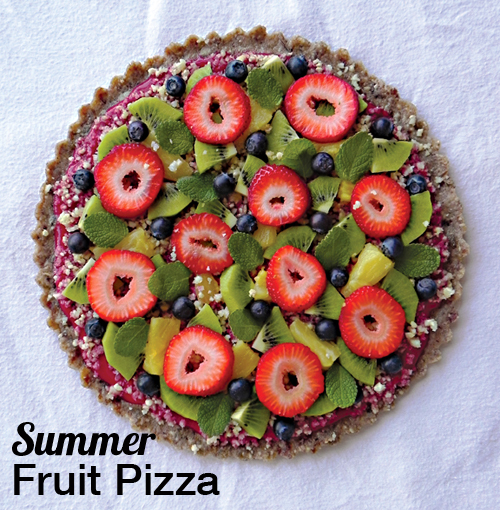 Summer Fruit Pizza from Practically Raw Desserts by Amber Shea Crawley – The end of summer also marks the end of RAWgust. Celebrate the changing of the season by using the last of the summer fruit in this super creative and tasty dessert pizza.